ShyAnne became a sanctuary rabbit and recently passed away. She developed severe neurological problems and was getting dedicated,special care in sanctuary from Carolyn M. Thank you. Hello. My name is ShyAnne. 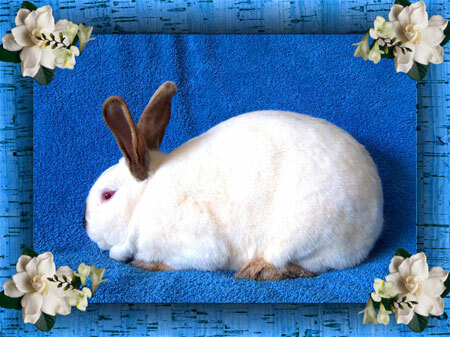 I am a quiet, gentle, big, beautiful, spayed Californian girl rabbit. My ears are a deep chocolate brown and my coat is creamy off-white. I'm very pretty to look at! Plus, I am a nice girl. I was rescued from a neglect situation where I was living with several other bunnies in very poor conditions. We had not had much positive interaction with humans, and we were tired, hungry and dirty. Because I have such a nice personality by nature, I have quickly been learning to trust. I am ready to find a wonderful forever home where I can be someone's special girl. I might even make a good companion rabbit for your spayed or neutered bunny. I'm still shy and so I would do best with someone who may be a bit shy and introspective themselves. We can listen to music and read together and keep each other company.